You get what you pay for… A true success by an Alexanderwerk customer on the performance of the WP120 Pharma Roller Compactor. 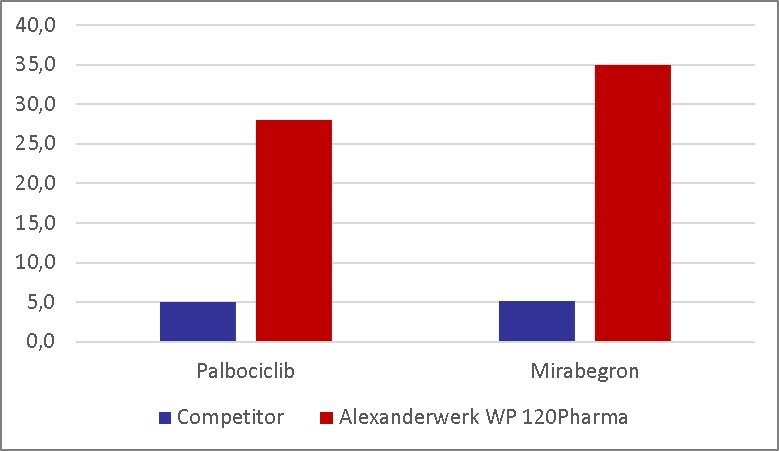 A global pharmaceutical customer approached Alexanderwerk to perform a comparative experiment on two specific drugs. The tests would focus on granulation of an anti-cancer drug (Palbociclib) and a muscle relaxant (Mirabergron). Production of both these drugs proved to be a bottleneck in the manufacturing process, due to the extremely slow capacities of the current in-house equipment. The side by side testing took place at the customer’s facility. The competitors model, a North American manufacturer, offered a system with 200mm diameter rolls, arranged horizontally and a dual feed screw system, one for pre-compression and one for feeding. At the current production rates, the system only could produce around 5Kg/hr of finished product, and required two to three operators to run the compaction operation. One of the largest challenges was the repeated bridging and plugging of the equipment, causing excessive delays and expensive downtime. Additionally, the fines percentage of the granulated product was very high, requiring the process to use a screening step. This led to more operators and additional concerns for operator safety (due to exposure). The compaction experts at Alexanderwerk analyzed the customers process challenge and pointed out that the design of the WP120, specifically roll profile, side seal design, roll orientation and extremely gentle dual stage granulation design would offer a much more effective and robust process. In addition, Alexanderwerk determined that the required press force could be decreased from 20Kn/cm to half the amount (10Kn/cm) which would allow for more compressibility of the material during tableting. Testing was done at first with Palbociclib material and initial results of 28Kg/hr were obtained, which already was 560% increase in capacity. Further optimization would still offer even higher throughput. For Mirabegron, initial testing resulted in 35Kg/hr, which was a 700% increase in capacity, with further optimization still possible. 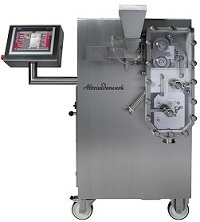 In comparison to the competition with a built in single mill, the Alexanderwerk multi-step milling process utilizing an integrated Flake Crusher and two RFG 100 (Rotary Fine Granulators) yielded a 50% reduction in fines over the competitors model. This gentle milling also resulted in a finished granule with a fines percentage low enough that eliminated the need for screening, thereby saving time, labor and equipment costs.